Traditional Banjaran border to used on any kind of tribal costume. 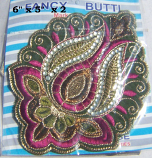 Banjara trims are vintage old trims. can be missing some part of embroidery or shisha mirrors.